Wet grind the moong dal along with(half qtys of the ginger and chillie pieces) ginger slits and green chilli slits and salt to thick paste,adding very less water. Remove in to a bowl. Add finely chopped onion pieces and the remaining half qty of ginger and green chilli slits. 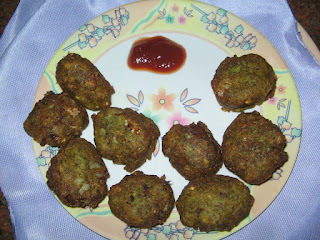 Mix well,lastly add jeera,and dhania powders..
Place a kadai with oil for deep frying,and deep fry the moongdaal vadas. This is a easy dish can be made within 15 minutes with moong daal batter.